Women and modern warfare. Women have fought to be treated as equals on the front line. A question of equality. The corollary to that is, they are open to being just as badly injured. Lindsey Ferrentino’s Ugly Lies the Bone could as easily have a male as its leading protagonist. Jess has been on the front line in Afghanistan and has returned horribly scarred, caught in the impact of an I.E.D – or IUD as her sister’s boyfriend Kelvin (Kris Marshall) keeps calling it. Jess has come back to Florida, to be cared for by her sister and to receive special treatment for her poor 30% burned body – a technique in which VR – virtual reality – helps to transport her to a different world, one of her making, a tree-lined, snow topped Montana. 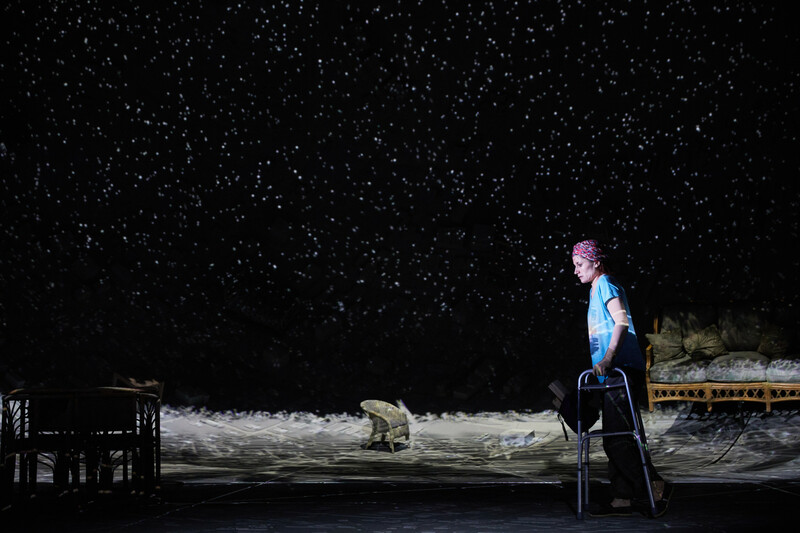 In Indhu Rubasingham’s fascinating, surreal, super-dynamic production, Es Devlin and video designer Luke Halls brilliantly transform the Lyttelton proscenium into at various points with a thousand starred sky, a satellite image of Florida below, a humble home and Jess’s virtual world. Ugly Lies the Bone is taken from a quote by Albert Einstein, `Beauty is but skin deep/Ugly lies the bone/Beauty dies and fades away/But ugly holds its own’. Thus it speaks to a highly individual state of being. And Ferrentino takes it as such. 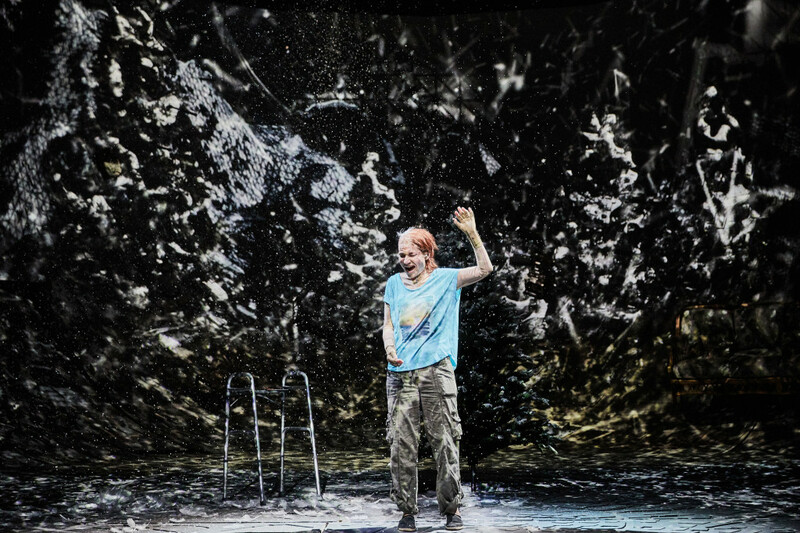 Ugly Lies the Bone is unequivocally Jess’s story with Kate Fleetwood’s horribly injured combat vet outstanding in conjuring both her physical and mental and emotional disabilities. And there are exquisitely personal, intimate moments in her rehabilitation journey as she tries to recover a sense of her previous self with Ralf Little’s touching, stumbling-for-words former boyfriend, Stevie. 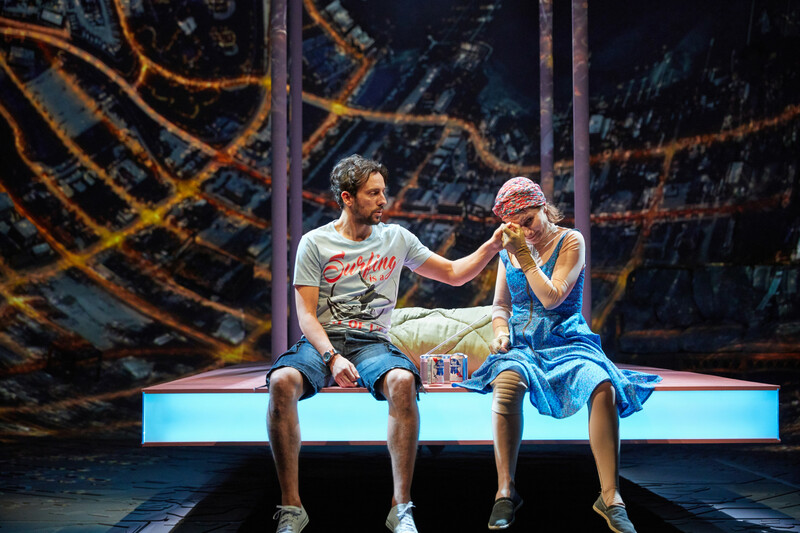 Some of the scenes however still hover on the over-sentimentalised but such is the nature of the subject, Fleetwood’s unsentimental Jess – head bound in a scarf, going through a vortex of emotions – and the scale of Rubasingham’s production that the whole thing moves beyond the individual into the universal. One is left with as many associated thoughts – about the immensity of our universe and ourselves as tiny specks within it and the extraordinary medical advances military conflict has produced by the research provoked in dealing with the terrible injuries produced by it, from WWI (plastic surgery) to this digital form of Mindfulness: distract the mind, move it into another sphere/dimension and the sensation of pain may be, for just a short time, temporarily at least, partially diminished. It’s a harrowing experience if nothing compared to those who have undergone such appalling injuries. As a play, it has its flaws. I much preferred Grounded, George Brant’s recent portrait of an American woman drone pilot and the effects upon her and her relationship with her family (recently revived again at the Gate Notting Hill after an initial sold out season in 2013) and its more ethically conscious examination of drone warfare. But Ugly Lies the Bone still hits the spot in terms of sensitivity and raising awareness. 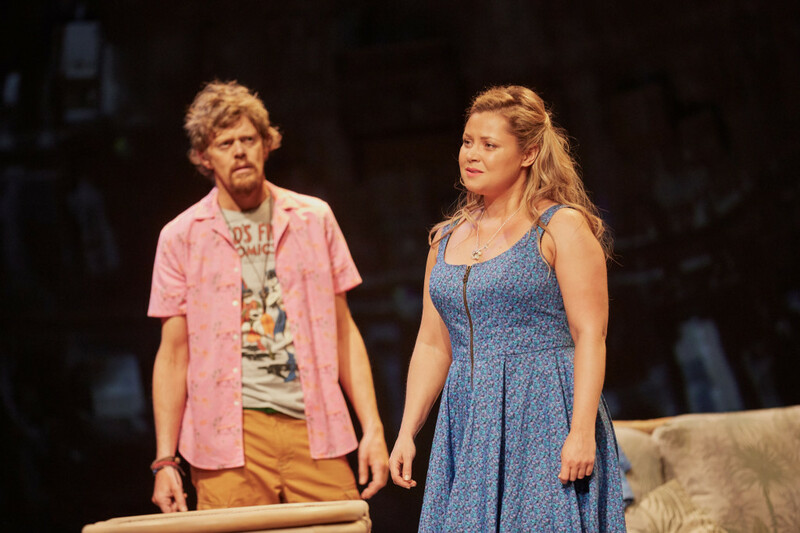 And there are beautifully detailed performances from Olivia Darnley’s carer sister, Kacie, trying to `hold it together’, Ralf Little, Kris Marshall and fleetingly, Buffy Davis as the daffy mother, already `in care’ herself but providing a sustaining sense of enduring love. Ordinary working-class people trying to cope with extra-ordinary, horrendous consequences. A powerful, hugely moving achievement. Recommended.